It's harvest and pressing time for members of the Bullfield Community Orchard in Alnwick. Picture by Tom Pattinson. The Friends of Bullfield Community Orchard will be holding their ever-popular Apple Pressing Day on Sunday. The event starts at noon with the Orchard’s annual general meeting, followed by a whole afternoon of activities, including apple pressing, green woodworking, felting and live music and refreshments. People are invited to take along their surplus apples for pressing, but take a container for the pressed juice. 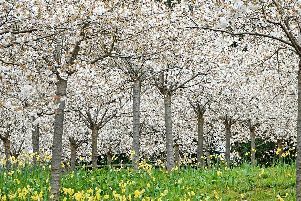 The Orchard, which has just won Silver Gilt in the Royal Horticultural Society and Northumbria in Bloom environment category, is home to a wide range of fruit and nut trees, soft fruit bushes, a wildflower area and a herb bed. The site is open to all for play and recreation, and the group has secured funding for a natural play area, due to be installed later this year. The site is maintained by volunteers, who hold several work days throughout the year, weeding, pruning and planting, and offers a great opportunity for hands-on learning and skill sharing. The pressing day will be held on Sunday at the orchard, which is off Weaver’s Way in Alnwick. For more see the Alnwick Friends of the Earth Facebook page.